The scientific evidence of design just got stronger. Armed with cutting-edge techniques, today's biochemists have uncovered startling molecular features inside the cell that can compel only one reasonable conclusion - a supernatural agent must be responsible for life. Destined to be a landmark apologetic work, The Cell's Design explores the scientific and theological impact of these discoveries. Instead of focusing on the inability of natural processes to generate life's chemical systems (as nearly all apologetics works do), Fazale Rana makes a positive case for life's supernatural origin by highlighting the many biochemical features that reflect the Creator's signature.This breakthrough book extends the case for design beyond irreducible complexity. These never-before-discussed evidences will evoke awe and amazement at God's creative majesty in the remarkable elegance of the cell's chemistry. "In Darwin's day, a living cell was thought to be quite simply - for all practical purposes - little more than a microscopic blob of gelatin. 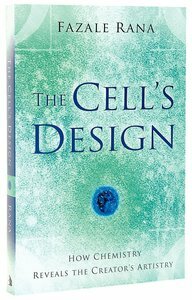 Rana lays out what contemporary science has learned about the cell's design, and he poignantly and provocatively shows that it is the handiwork of not only an Intelligent Designer but specifically the God revealed in Scripture." "Fazale Rana's welcome sequel to Origins of Life makes a significant contribution to the growing scientific literature pointing to intelligent design." - Kenneth Boa, president, Reflections Ministries. - Publisher Armed with cutting-edge techniques, biochemists have unwittingly uncovered startling molecular features inside the cell that compel only one possible conclusion?? ?a supernatural agent must be responsible for life. Destined to be a landmark apologetic work, The Cell?? 's Design explores the full scientific and theological impact of these discoveries. Instead of focusing on the inability of natural processes to generate life?? 's chemical systems (as nearly all apologetics works do), Fazale Rana makes a positive case for life?? 's supernatural basis by highlighting the many biochemical features that reflect the Creator?? 's hallmark signature. This breakthrough work extends the case for design beyond irreducible complexity. These never-before-discussed evidences for design will evoke awe and amazement at God?? 's creative majesty in the remarkable elegance of the cell?? 's chemistry. About "The Cell's Design: How Chemistry Reveals the Creator's Artistry"
Armed with cutting-edge techniques, biochemists have unwittingly uncovered startling molecular features inside the cell that compel only one possible conclusion?? ?a supernatural agent must be responsible for life. Destined to be a landmark apologetic work, The Cell?? 's Design explores the full scientific and theological impact of these discoveries. Instead of focusing on the inability of natural processes to generate life?? 's chemical systems (as nearly all apologetics works do), Fazale Rana makes a positive case for life?? 's supernatural basis by highlighting the many biochemical features that reflect the Creator?? 's hallmark signature. This breakthrough work extends the case for design beyond irreducible complexity. These never-before-discussed evidences for design will evoke awe and amazement at God?? 's creative majesty in the remarkable elegance of the cell?? 's chemistry. Fazale Rana (PhD, Ohio University) is vice president of research and apologetics at Reasons To Believe. He is the coauthor, with Hugh Ross, of Origins of Life and Who Was Adam? Rana lives in Upland, California.